About Property Management specialises in property management services and is looking for more investment properties in Carina and surrounding suburbs. Our boutique family run agency has a personable approach and we can guarantee next level service. Carina is a suburb of Brisbane, Australia. 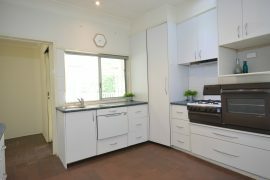 It is located 7 kilometres east of the CBD, and borders Carindale, Carina Heights, Cannon Hill and Camp Hill. Carina is a mostly residential suburb. The Clem Jones Centre (a large sporting complex) is located in Zahel street, and a Brisbane City Council bus depot is situated on Creek Road Carina. The suburb is home to the Carina Tigers Rugby League Football Club. Carina’s terrain varies from flat on the Bulimba Creek floodplain in the suburb’s east, to hilly in the suburb’s west towards Seven Hills and Camp Hill. Traffic conditions are busy along its major roads including Old Cleveland Road, Meadowlands Road and Stanley Road, Richmond Road, and Creek Road. Recreational cycling opportunities are consequently limited on the west side of the suburb. However, the presence of Porter’s Paddock parkland including the Bulimba Creek Cycleway provides for good opportunities on its east side. As at February 2016 several citywide, on-road cycle routes pass through Carina. Old Cleveland Road is a radial route that includes intermittent, formal bicycle lanes. Meadowlands Road is a radial route that contains paved shoulders that serve as informal cycle lanes, while Stanley Road is line-marked as a Bicycle Awareness Zone (yellow stencil stylized bicycle marked on edge of vehicle travel lane). Richmond road contains a formal bicycle lane westbound and a Bicycle Awareness Zone eastbound, while parts of Creek Road have paved shoulders that serve as informal cycle lanes. Packs of cyclists are commonplace along Old Cleveland Road early on weekend mornings. The hilly terrain in the suburb’s west side and busy traffic conditions also impose some impediment to local walking opportunities. However, the grid structure of the road and street network and the presence of urban borders (verges) on almost all roadways promote relatively direct and safe walking conditions. The higher order local streets and the major roads mostly have paved footpaths on one or both sides. The major roads contain numerous signalised intersections with pedestrian control, which are typically located adjacent to bus stops. Refuge islands support safe crossing of certain other roads and streets. In addition to local pocket parks, nearby recreational walking attractions include Seven Hills Bushland Reserve to the northwest, and Potter’s Paddock parkland in the suburb’s east. The 2011 Census recorded 10,301 residents in Carina, of whom 52.7% were female and 47.3% were male. The median age of the population was 34; 3 years younger than the Australian average. 71.6% of people living in Carina were born in Australia, with the next most common countries of birth being New Zealand (4.8%), England (3.3%), India (1.3%), South Africa (0.9%), and the Philippines (0.7%). 81.4% of people spoke English as their first language, while the other most common responses were Spanish (1.3%), Cantonese (1%), Italian (0.9%), Mandarin (0.8%), and Greek (0.6%).